Father's Day is coming soon and Mommy Knows What's Best is celebrating with the It's Daddy's Day Giveaway! Do you know a new or expectant dad who would love some great gifts for Father's Day? This looks like a wonderful giveaway!! So be sure to enter today for your chance to win it for a great man in your life!! Good luck to each of you that enters! All of these gifts can be found at DaddyScrubs.com, a great site for gifts for new or expectant fathers. Mommy Knows What's Best reviewed the Daddy Diaper Pack for DaddyScrubs, and she loved it! 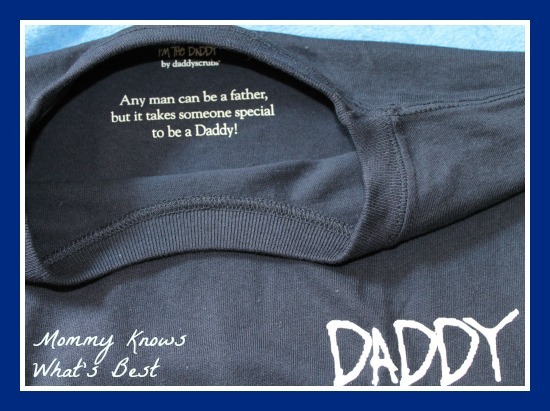 Read the review and find a special discount code for DaddyScrubs here. Need even more ideas for first time dad gifts? ThePracticalMommy has a great list of ideas in her article Gift Ideas for First Time Dads. 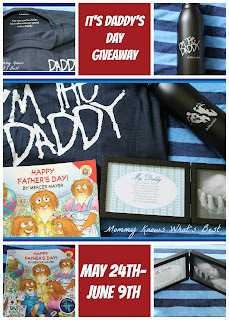 Enter to win the It's Daddy's Day Giveaway prizes listed above! Complete the tasks in the Giveaway Tools form below. Giveaway begins May 24th at 1 am EST and ends June 9th at 11:59 pm EST. US and 18+ only. Mommy Knows What's Best and Lisa-Queen of Random are not being compensated for this post. Mommy Knows What's Best is responsible for prize shipment. Go With Me Chair Giveaway Announcement! Going to see FAST 6 tonight!!!!!!!!!! Apple iPod Nano Giveaway Announcement! I Love Summer Giveaway Days Announcement! Bloggers this is a great way to make some money!! Baby Shower Cake Pops Giveaway Announcement!! Baby Week Blogger sign ups! the Voice - LOVE Adam's team!!! Coach Messenger Bag Giveaway Announcement! The Voice - Vin Diesel Fast 6! !